I don’t think there’s a better feeling for a skater than getting on the skateboard and hitting the tracks in the skate park. Talk about adrenaline hitting the roof! It’s the type of activity you crave to do every day, not just something you feel obliged to because you don’t want to end up forgetting how to ride the deck. 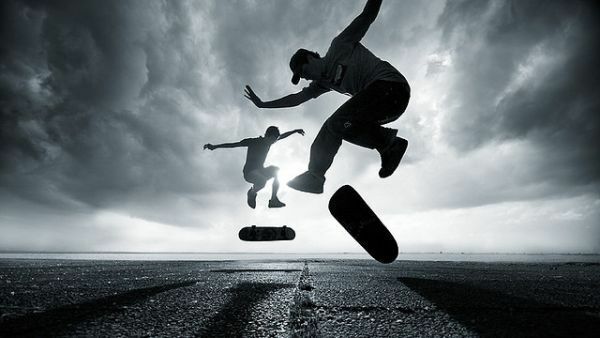 Skateboarding gives you a unique feeling – once you put your feet on that small piece of wood and the wheels start rolling down the road, you feel the control, the urge to speed up and eventually jump with the skateboard and try to keep it on your feet while in the air. Yup, it’s kind of art as every skater will do a different move in his own specific way, which means the chances for someone to repeat a move are very low. And yes, there will be a lot of falling if you’re a beginner, and sometimes even when you have a lot of experience, because lets face it: concentration fails us all at some point. No worries, nothing scary. You’ll still have the satisfaction of being a skater, owning a certain clothing style and best of all, having a skateboard that catches the eye of fellow skaters and well, familiarized and interested girls. So, is it time to buy skateboards with more consideration than before? Definitely. Here are a few things not to neglect. You must be wondering why not cheap. Because my dear friend, when you buy skateboards, you buy to ride them, jump with them, hit the concrete tracks and steps and various metal poles and basically do all sorts of joggling tricks with them. You don’t want the result to be a scratch, damaged graphic and colour and maybe even a damage so big you’ll need to replace the board. So, it’s better to spend a couple more dollars on a good deck that will last than to buy a cheap one and simply lock it on the top shelf for exhibition and admiration because it looks so good but you don’t want to ride it because it’s so fragile. Your choice. A skateboard is like a piece of art; if you’re honest to yourself, you’ll admit that the graphic on it has a great role in the fact whether you’ll buy the board or not. Choose fancy, good-looking, rich graphic – you’ll be happy, trust me. But, do not rely your decision entirely on that small detail; it won’t do you any good if the graphic is amazing, but the board dismantles after a week. Once you get the board you so much love, you need to keep it in shape. Gripping the surface is most important here – do not forget to do it. Not just that it’s recommended that you grip the board every time before you hit the tracks, but the sole action itself is therapeutic. Get a grip tape when you buy your skateboard.